Posted by claireblang in 2009 Season. I’m here in the Lowe’s Motor Speedway garage talking with team guys about the chances that we’ll get this race in and that it will indeed be the Coca Cola 600 and not the 500 or less. The weather is teasing us with moments that appear brighter with dark clouds on the horizon and green blobs on the weather radar. Many of the team guys told me that they were to be working Monday anyway so they might as well be at the race track. Others were planning family or team cookouts and several said that if this race gets done soon enough they are going to head to cookouts that will be several hours delayed. Several team guys told me that their marriages depended on days like this Memorial day off to hang with the family. Instead, they’ll be racing because that is what they do. Everyone here is talking about the Tuesday meeting that NASCAR has called with primaries on the teams. While everyone is talking about what the meeting might mean related to tweaks to the car of tomorrow there’s no indication that has anything to do with the meeting. Crew chiefs are not a part of the meeting because it’s not about nuts and bolts. The meeting’s to be held at 10 and 2 p.m. will include drivers, team owners and team general managers if they’d like to come. It’s an open forum and the conversation in the garage is who might speak up and who are the leaders in the sport who might stand up and express their thoughts openly. Names in the garage being brought up, Jeff Gordon, Tony Stewart, Jeff Burton and Michael Waltrip. Some drivers told me that they do not feel it is their place to stand up and that they will go and listen but that they miss a guy like Dale Eanrhardt who would have NASCAR’s ear. 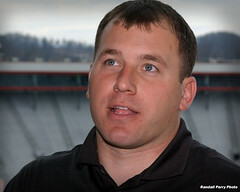 With E it was a two way street – he’d not only go tell NASCAR what he thought – they’d come to him to solicit advice. Let’s not forget though that NASCAR has had these meetings several times a year recently when they feel it just might be a good time to lend an ear and an open forum to the teams. NASCAR has always said that their door is open and that drivers do come in and vent and offer suggestions. From within the garage – there is conversation today that they miss Dale Earnhardt at times like this because they trusted him to speak up on their behalf behind closed doors. I was on the air with “Dialed In” for the rain delay coverage here at LMS and talking about some of what Speedway Motorsports CEO Bruton Smith had to say in a sit down with the media here on Saturday. You could have heard a pin drop in the room when he addressed the controversial topics of the day and talked about why he and former track president H.A. Humpy Wheeler and he parted ways on the worst of terms. Humpy, who retired, had been invited by Tony George to go to Indy for the Indy 500 this past weekend….and there was word that Humpy had not been invited to attend the 50th running of the Coca Cola 600 here at LMS. While discussing what Bruton had to say my cell phone rang. I was on air – which makes answering a cell phone difficult but managed to get the phone answered off air while on air which is kind of like walking a tightrope while dancing. It was Humpy Wheeler, calling and I asked him if he’d come on air with me and open up about his side of the story. He agreed and I appreciate it. For 45 minutes, Humpy answered my questions and talked about not only how he felt about not being invited to LMS for the 50th Coke 600 (Bruton says he does not invite people and that Humpy has a NASCAR hard card to get in) but also how he felt about other issues of the day. Humpy Wheeler is the real deal. I got laid off of a job at one point in my career and it was not easy. Funny how your phone rings when you are all that – but when you are down and out for one brief moment in your life (even if it lasts an hour a day or a month)- the phone calls come only from those who really are your friends. You never forget who it is that is there for you in tough times. Humpy called me at my house while I was languishing in self pity and feeling pretty down and out the day after I got laid off. I had no idea that he even knew how to reach me. He talked me through the time in his life when he lost his job through no fault of his own (because of tough economic times) and how it felt and advised me to never look back. I had never figured a guy like Humpy would have had that sort of moment in his life but he did. This rift between Humpy and Bruton is sad and private, because none of us knows what actually goes on behind closed doors. Both of these guys love racing and the two made magic together. Bruton is a hugely successful man who has always been kind to me on his property covering this event and Marcus Smith is working hard to carve his own niche as president of this track and to serve the fans in a way that will make the guests to his dad’s track proud. But Humpy should not feel that he is not welcome at LMS (whether it’s intended or not) and Humpy Wheeler is valuable to the sport. I will tell you one thing – Humpy taught me a valuable lesson – I now call everyone I know who is laid off, fired, or looses a job due to the economy or for any other reason if I have their number. We often feel the person will be bummed out and that they will not want the call – but I have never found that to be the case. Humpy will survive – he doesn’t need an invitation to LMS to continue to be called on for quotes and respected for what he accomplished in this sport and Bruton says he doesn’t invite folks and that Humpy could come with his NASCAR hard card. Maybe so. Like I said – no one knows what actually went on behind closed doors and we’ll never know for sure. All I know is that these are two powerful guys in the sport and I wish they could get along. I also appreciate the call from Humpy. Posted by claireblang in 2009 Season, Fun Stuff. Driving the car in the Sprint Media Pit Crew Challenge! 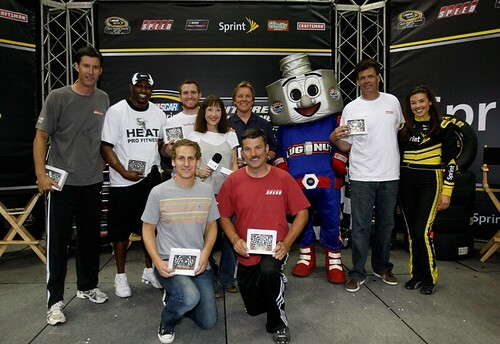 My team in the Sprint All Star Media Pit Crew Challenge. Michael Waltrip, Brian Vickers, Rick Allen, Ray Dunlap, Phil Parsons, O.A.R. drummer Chris Culos, and former Patriot safety Tony George. A shout out to those guys, they knocked it out of the ball park pushing the race car, changing tires, jacking, and of course the key to winning the challenge……… pushing! Ok, so I was asked to represent the SIRIUS NASCAR Radio team in the event. Naturally I wanted to do well for the team. Daniel Norwood, our SIRIUS NASCAR Radio Program Director told me to just go, represent the team, and have fun. He reminded me that I was participating just to have fun. Right. I get to the Time Warner Arena and one member of my team is putting on knee pads. Sign number one. Then, the first thing that happened was Michael Waltrip addresses the team by telling us all, “Just remember we’re NOT doing this for fun, we came here to WIN!.” Oh Noo!! I was there for the wrong reason! The team gives me the job as the driver of the car since I am the lightest. I am to steer towards a brick wall and not brake until they tell me to. I went to Brian Vickers who was on my pit crew for advice, “You can screw up…only if you turn the wheel or brake too early,” he says. He told me that as the driver I could get mad if he screwed up on the pit crew. “You just cuss me out. Just drop everything you’ve got,” he said of what I, as the driver,was allowed to scream at the tire changer in angst if he under performed. Sounds like fun! “When we cross the finish line and the car is about to slam into the wall and they’ve declared us the winner, we’ll tell you to hit the break,” SPEED’s Ray Dunlap told me with a grin. He was not joking, or was he? Waltrip, who was going to carry tires gave me advice on being the driver. “You can complain a lot. You can say you need more money and say you need for somebody to pay for your motor coach and a bunch of things like that,” Waltrip joked. Wow, this driver thing was going to be ok.
“Do not touch the brake, DO NOT TOUCH THE BRAKE,” Rick Allen instructed. Two minutes later, he turned to me and he repeated, “AGAIN, the most important thing is NEVER TOUCH THE BRAKE. I mean the wall will stop you, he joked. Beautiful. Is he joking? “Local news is here we’re going to kill them,” Ray Dunlap told us. “MRN is here they’ve got no chance,” Dunlap says, trash talking from the start. Then, I eye and point out the team from the U.S. Army and, come on, they looked pretty tough. Chris Culos, the drummer from O.A.R is on our team. I got a kick out of him. The discussion is whether he or Vickers changes the tires. Chris has changed a tire on the side of the road before but it took him an hour. “Chris, you are our rhythm,” Rick Allen tells him. “I can do that,” he says with a smile. Culos is the tire carrier and Vickers the tire changer. Former Patriot safety Tony George, appears and we are willing to trade anyone on the team for him. I think the’s guys would trade their mother to get him on the team. We take him, and he’s not only strong and fast, he’s motivated. We get through the first round and some of the guys on the team are only slightly winded. Not Waltrip, he’s a machine. You did a good job, you didn’t hit the brake,” Vickers told me after the first round. Phil Parsons also gives me a high five, “Good job driving,” he said. Waltrip pulled us into a team meeting after we moved ahead through the first round and changed positions on the team to set us up for an even faster round. This was not his first rodeo and he was in it to win it. “Ray (Dunlap) went to feed the meter -are you kidding me?,” Allen jokes while Waltrip is giving a pep talk and reorganizing. Everyone does what Waltrip says and his team meeting was a key to the win. By the time we got to the finals I asked Tony George if he had any Patriots motivational words for us, “Absolutely, we can’t talk about it we have to BE about it,:” he says. Nice. ” It’s time to go and GET IT now.” Why do I start to think if I mess up I might get thrown into that darn brick wall. “You got anything left?,” I ask Dunlap, before our last and championship round. “I am about out,” he says. ” I wake boarded yesterday on Lake Norman and I’ve got muscles that I didn’t know I had. But guess what, we are in it to win it THAT’S WHAT WE CAME FOR,” Dunlap yells at the top of his lungs. Dunlap is more focused than ever now that there is money in the meter which is running. The guys are tired so I decide on the last round I’ll pull out the secret weapon. I will yell and scream at the top of my lungs at them to go faster as they run. It can’t hurt right. I am the driver, that is my job. If they get mad at me they will push harder. I position myself back in the car with a quick prayer that I not mess things up. “DO NOT BRAKE, DO NOT BRAKE.” Braking with a concrete wall coming at you is the natural tendency. The wheel is a little askew to the side since the guy who put it in was someone just standing by- not the official that did it the first few times. I was straining to keep up in the seat since the brake pedal was where I could not reach it and sit back in the seat. I had to pull up on the wheel while steering to where I could be in position to hit the brake when it was time. Bless Brian Vickers heart, he screamed “brake,” each time to me when it was time to slam on it…. and I swear until he said it, I was not going to brake.. The last heat, I was literally screaming to the guys pushing the car, “Last round guys, faster, faster, faster, get it get it get it.” I was screaming really loud figuring it would be worth a tenth of a second if I was egging the guys on. It hits me that I am yelling at Brian Vickers and Michael Waltrip. Steer, yell, brake. Towards the end of the final round it was hard to keep up in the seat…..but I would have rather have walked through fire, or hit that dang concrete wall, than brake and let the team down. Can you believe it – we won. I didn’t do much…and can’t take any of the credit. These guys were serious. It was fun…..I laughed so hard busting the chops of the team – and it was a good afternoon out before two weeks of covering events all over town for the Sprint Cup All Star Race and the Coca-Cola 600. That is the first (and likely last ) time I will ever be in Victory Lane with Michael Waltrip and Brian Vickers and I am holding the trophy as the driver. LOL. I think I’ll keep my day job. Congratulations team! We did it. P.S. Speaking of my day job, My show, “Dialed In” will be LIVE at the Sprint Cup All Star PIt Crew Challenge from 7-10 EST tonight. The real event will match the best in the business on pit road against each other. It’s one of my favorite events and I’m excited to be able to help bring it to you LIVE on SIRIUS NASCAR Radio channel 128. (Friday, May 15) – covering all events at LMS and no “Dialed In” as Qualifying and Truck Racing take up the schedule. Friday morning I will be at the DEI fan celebration on the DEI grounds from 9-11 covering the event. Saturday(May 16) “Dialed In” from 2-3:45 p.m. EST – then the SIRIUS NASCAR Radio pre race show followed by LIVE post race coverage at which time I will be stationed LIVE in Victory Lane. Sunday (May 17) “Dialed In” 11-2 p.m. EST post coverage of the Sprint Cup All Star Race! My mother’s name did not make headlines, except when she was married. She has not been on the radio nor does she have a national following of people from all over the country who kindly tell her over the airwaves what a great job she has done in her chosen profession. Unless you are part of the family or one of her friends or associates you might never even know who she is, what she is about, how brilliant she is or even what her name is. Therefore, today, I have listed my mother’s name in the headline above. I’d like to give Therese (Kiessling) Bennett that distinction today because she deserves it. My mother was widowed with a three year old, a four year old and a five month old when she was very young. I can’t imagine how she even got through it. I have pictures of us when we were little in which, despite all she had on her plate, we three little girls were dressed in designer coats and hats that she sewed us herself for Easter. Mine was blue with a black velvet scoop collar. I remember every single outfit my mother ever sewed for me. From dresses to wear on trips or special occasions to the start of school outfit she made each of us, to prom dresses – we got to go pick out a pattern and the material and my mother would sew. When I was in college I got very ill and had to leave school and go home during my second year.. I nearly died and it was my mother who nursed me carefully back to health. She received no award, was showered with no national acclaim. She stopped her life at that time to save mine. Her only payback was the knowledge inside that her daughter was safe and sound and back in college, healthy again. My first radio job offer came at a time when women were not on the radio. Silly me, I graduated college and got my first job offer at a radio station in Cedar Rapids, Iowa. Trouble is – I had my first serious boyfriend and wanted to give it all up for this boy . I did not want to move to Iowa, I was in love. I cried and cried and cried and cried (I was a bit dramatic) and my mother pushed me out of the nest forcefully. I thought I’d crash on the ground, never find love again, and like a bird that never could learn to fly would fail if I left and never live or love another day. What I did was fly, see, experience and grow, soaring into a tough and competitive world that would be my new career. Oh, and by the way, the love relationship with the boy fell through – he dumped me. My mother wanted me to do some of what she never had a chance to do. My mother was way ahead of her time. She insisted on almost a nutritionist view of healthy eating. We grew up eating steamed vegetables, and low fat and whole wheat and non-processed foods long before it was in vogue and the nation turned to needing desperately to loose weight. We just grew up that way because of her strong views on nutrition and it’s paying priceless dividends years later. She never received a bonus or a raise for this or a compliment from the boss. Who even knew then she was so incredibly smart. Now, years later, the world is turning to what my mother professed was the right way to eat. It’s all I ever knew and I am in great shape and am extremely lucky. My mother was a nurse in the emergency room in Milwaukee. She went on to become, like her grandmother who brought the first sewing machine from Germany to Wisconsin, a fine tailor. Her sewing and tailoring of everything from men’s suit to bridal gowns to formal dresses is beautiful work. In her later years, when my father closed his men’s clothing store she went out one day and went to Marshall Fields and applied as a tailor in their sewing department. She did this on her own without telling anyone. She was nervous because although she had tailored in my dad’s store for years and had done fine sewing all her life she had never been formally trained. She came back with a part time job and I was so amazed and proud of my mom for having the courage to do that. She is an incredible seamstress and they loved her work. My mother is truthfully a brilliant woman. She is a gifted artist, she’s a championship level scrabble player, she can upholster furniture, cane chairs and the list goes on and on. She is cross country skis miles and miles in the winter and hikes or walks way beyond what I can handle every day. She’s in great shape and she’s beautiful. She looks 60 (twenty years younger than she age). Part of that is a lifetime of great nutrition. The other is something that I learned from her – that there is no age – it simply does not exist. She can out walk, out hike, out ski you and she doesn’t plan to stop. Age does not factor into her DNA. My mother told me once that it doesn’t matter how old you get as long as you keep your body up and stay in great shape. She was right. My mother is just now becoming even more fun than ever now that the weight of family responsibility is not so heavy. She’s great fun to be around. She’s an inspiration, a gifted woman and extremely smart. She cried when I thanked her the first time for naming me Claire (something that I’ve done a lot). Every time that someone in the garage says “Hey Claire,” and uses my name, I think how thankful I am that my mother gave me a special name. One day my mother said to me that she really did not accomplish anything huge in her life. I told her that she indeed did. It took many generations of women to get to me breaking the door down in sports talk radio via NASCAR. My mother gave birth to me and together we knocked down that door. I will always be indebted to her for the way she raised me. Today, my mother gets the headline. She’s the one who deserves it. Had she had the opportunities that I had she would have been a doctor perhaps or gone on to pursue something that she always wanted to do. Instead she focused on me and my siblings and I will be forever grateful. Because of her I am all that I am today. I wish everyone could know her. Maybe through this they will know a little more. It’s an absolutely beautiful and sizzling hot day here. I think about the traditions of this race track and the history that made it what it is today. I think about all the true racers who never gave up on this place including the man who had the idea to build a race track here. When it comes to tenacity – the name Harold Brasington comes to mind. A local Darlington business man, Brasington returned from the Indy 500 in 1933 and told some of his friends that he wanted to build a paved superspeedway in Darlington, South Carolina. His buddies likely laughed at him. Imagine your friend is sitting at the local restaurant or bar here in Darlington that many years ago and he tells you of this giantic race track plan. But Brasington proved to be a stubborn man. In 1949 he set out to build his dream on land that once grew peanuts and cotton and here we are today. Matt Kennseth won the Diamond Hill Plywood 200 – and has the pole for today’s race. I told him after the race about Carl’s forearms hurting after practice from gripping the wheel. Kennseth had just battled the lady in black for one hour 47 minutes and 33 seconds. He was soaking wet and fresh from the win. He joked with me that he was in better shape than Carl –so no problem. All of the drivers have been talking about the surface here and how much it changed since a year ago and the repaving. Greg Biffle’s crew chief Greg Irwin is cranked up — he thinks that Biffle is so good here that we’re sure to see something spectacular from him today. Dale Jr used to not like this track at all. It was so abrasive…..and not one of his favorites. “It’s my job weather I like it or not,” he said yesterday of racing here. He called the track “this is the hardest place to pass on on the circuit,” he said. This will be a long, physical race. “Fast and Furious” Broadcast Schedule for Saturday Night Race Weekend! The broadcast schedule this weekend is fast moving. Before we know it this race weekend will be over. If you blink you will miss it so get ready! Love racing at Darlington. I’ll be on the air with “Dialed In” tonight (Friday, May 8th) after the Diamond Hill Plywood 200 Nationwide Series Race until 11 p.m. EST LIVE from the media center here at Darlington Raceway. Tomorrow (Saturday) “Dialed In” from 2-3:30 p.m. EST LIVE will lead into the start of the SIRIUS NASCAR Radio Pre Race show at 3:30 p.m. EST. Then, I’ll be in Victory Lane LIVE on the SIRIUS NASCAR Radio post race show after the Cup race. That show will take coverage up until 1:00 a.m. Sunday morning. Mark Martin just came into the media center here at Darlington beaming and talked about his decision to race full time at Hendrick Motorsports next year. He was all smiles and had his rock of a crew chief (solid, brilliant, on his focused game on the podium) with him. Mark said he wouldn’t sign up for 2010 even though it’s what Rick Hendrick wanted in the first place until he was satisfied that the pairing would work. Fast and furious – two garages and tons of stories to work on. Posted by claireblang in 2009 Season, Drivers. I arrived with a heavy heart in the media center here at RIR and here in the deadline room there is a spot reserved for David Poole – noted motorsports journalist who passed away this past week. A sign reserving his spot and his photo sits where he would be covering this event….right in front of the news conference stage. It just seems not right. Yesterday’s funeral was very classy, short and sweet, and left many of us with our own private thoughts and aches at the loss of our comrade. It was not about slide shows and music and speeches and tributes, it was about scripture and listening to the minister and private soul searching. I have many thoughts deep inside about all of this and like the rest of us am dealing with it both on the air but also much of it alone inside. It’s sad because this media group needs to support each other into healthy living which is tough on the road and I wish we could have gotten David to get healthy. It’s really tough because David was such a presence….but this is a tight group and it seems already that in the rough and tumble world of the media corps, press room here at RIR it seems that the media group is just a little bit warmer, with hugs and support to each other this morning. It’s a competitive group but where it really counts we are family. 2:00 p.m. EST until the start of the Sirius NASCAR Radio Pre Race Show (Sprint Cup Series) at 3:45 p.m. EST. I’ll be anchoring pre race from the booth (Steve Post in garage) and in victory lane LIVE after the Sprint Cup Series Race on the post race shows. I have gotten so many emails at ClaireBMail [at] ClaireBLang.com and it’s been such an insane week with the passing of David Poole that I have fallen behind answering…but am catching up and if you have not gotten a reply yet – I will definitely do that. I really appreciate your emails at the above address and will have more blogs from the media center this weekend. For now….I want to say thanks for your support and friendship. It’s been a tough week. I do know that David would have wanted us to move on to the racing as a way to get our minds off of the loss we all feel. PS – There are so many people grieving each in their own way. Some are not on the air public- editors, PR people, co-workers, track workers, officials. Some like Jim Utter from thatsracin.com worked with Poole for ten years..sat next to him, ate dinner with him, worked on story budgets and stories with him week after week, traveled with him and knows him better than anyone. He is holding up and putting on a brave front. We all had inside jokes….and our own private talks and things we teased Poole about and laughed with him about in the many hours we waited out rain delays that the next guy – could never know – could never understand or put into his own words. We will all deal with this in our own way….and we’ll get through it together in our own way. We need to support each other as much as we can right now.